Cartoonish propaganda punctuates the last leg of the "Arab Spring." Bangkok, Thailand June 9, 2011 - In January 2011, the unrest in Tunisia and Egypt took many by surprise. Amidst the confusion, the global elite and their nefarious networks of NGOs, civil society organizations, and foreign-funded, trained, and armed opposition groups were able to dislodge the governments in both nations. As similar gambits were being simultaneously triggered in Yemen, Syria, Bahrain, Algeria, and Libya, the alternative press as well as networks like PressTV and Russia Today began airing the possibility that these were in fact engineered events rather than "spontaneous" uprisings. The Syrian uprising was never "peaceful" and was rife with arson and gunmen from the very beginning. 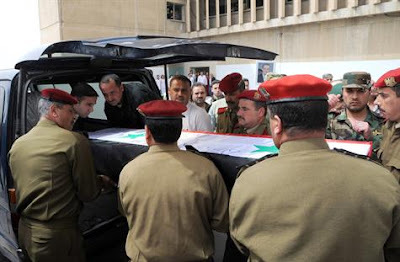 Military funeral services like the one above have been taking place to bury security forces killed systematically by "peaceful protesters" throughout the weeks of unrest. Now half a year into the contrived "Arab Spring" entire nation-states, including China are openly accusing the West of engineering unrest across the Arab world, in Pakistan, and even on Beijing's own doorstep. With Russia, India, Brazil, and China tacitly condemning the West's imperialist war against Libya, it is hardly appropriate to call the escalating mayhem an act of the "international community." The window is closing quickly on the globalists as both nation-states and individuals alike grow weary of the "Arab Spring" which has most certainly overstayed its welcome and transformed into a bloodbath rather than the peaceful revolutions they were sold as. As details trickle out as to just how these "revolutions" were engineered and that it was the unelected corporate-funded think-tanks, not computer savvy youths, who triggered and led them, the prospects of launching wars of "intervention" against states now or soon to be fighting against this insidious ploy are growing dimmer by the day. The latest propaganda from the corporate-owned media reflects an almost palpable sense of desperation. A BBC article on Syria titled "Syria crisis: Turkey refugees fear for Jisr al-Shughour" contains an entire section devoid of a single verifiable fact, citing unnamed refugees who may or may not even exist, telling hair-raising tales of brutality, neglecting to supply even a single shred of evidence. The Telegraph chimes in with a similarly absurd story "profiling" Maher Assad of Syria, citing "dissident accounts," entirely unfazed by the immeasurable void in objectivity within their report. The same article also cites not one, but two admittedly unverified videos purportedly showing Maher Assad committing acts of violence, as well as the weasel phase "many Syrians" who believe he is Rifaat Assad reincarnated, concluding that "it is little wonder, then, that thousands are fleeing his advance through the northern province of Idlib on a mission to take vengeance against the rebels of the town of Jisr al-Shughur." One can almost visualize the memos forwarded by the corporate-funded think-tanks sitting on the desks of these propagandists driving them to write ever more absurd narratives in the place of the actual journalism outfits like the Telegraph and the BBC have long since abandoned. By all accounts now, weapons have been taken up against the Syrian government amidst an admittedly foreign-funded uprising. While media outlets like the Christian Science Monitor feign ignorance by asking "Has Syria's peaceful uprising turned into an insurrection?" it was clear that arsonists and thugs were working amongst protesters provoking Syrian security forces from the very beginning. In an April AFP report, Michael Posner, the assistant US Secretary of State for Human Rights and Labor, stated that the "US government has budgeted $50 million in the last two years to develop new technologies to help activists protect themselves from arrest and prosecution by authoritarian governments." The report went on to explain that the US "organized training sessions for 5,000 activists in different parts of the world. A session held in the Middle East about six weeks ago gathered activists from Tunisia, Egypt, Syria and Lebanon who returned to their countries with the aim of training their colleagues there." Posner would add, "They went back and there's a ripple effect." That ripple effect of course is the "Arab Spring." Ironically, the same Mark Toner of the US State Department who defended funding Syrian opposition groups ahead of the unrest currently destabilizing the country, has now said of the unrest along Israel's borders, "we condemn what appears to be an effort by the Syrian government to incite events and draw attention away from its own internal issues." Toner would go on to say, "Israel, like any sovereign nation, has a right to defend itself." With America's defense of Israel, claiming it was justified to gun down protesters allegedly "provoked" by Syrian meddling, it has both conceded that such protests can in fact be engineered and that nation-states have the right to defend against them, including with the use of deadly force. This not only undermines America's position on Syria, but entirely undermines and strips all credibility away from the illegal ongoing US-EU war against Libya. Such overt hypocrisy coming out of the US State Department, as well as the British and French foreign ministries, signifies that the official narrative of the global elite has unraveled into unparalleled absurdity. Undoubtedly the final outcome the elite are pursuing is not only regime change in Libya and Syria at any cost, but eventual (and engineered) regime change in Iran before turning their attention east toward Moscow, China and their peripheries. Whether the elite reach that final outcome depends on the citizenry suffering under their incompetent, illegitimate leadership and whether or not they can see who really sets the agenda and that boycotting and replacing them entirely on a local level is the solution.